I've tasted one remarkable 2013 Beaujolais after another as these have been released and the recently landed Château Thivin Côte de Brouilly, a must-buy Beaujolais every vintage for me, is another knockout. This is the oldest estate on the Mont de Brouilly dating back to 1383(!) when the first part of what was to become Château Thivin was built. The domaine is now run by the Geoffray family, the sixth generation Claude-Edouard having come aboard in 2007. Farming of these avg. 50 yr old vines is impeccable here with almost everything done by hand from pruning, plowing and canopy management to harvest. Considering the 48% slope of the vineyard, this is actually sort of a dangerous undertaking. The winemaking here is also very traditional with hand harvested fruit transported to the cellars in small baskets where the whole bunches are fermented on native yeasts. After a gentle pressing, the wines are transferred to giant oak foudres of between 2,000 and 4,000 liters, some of them over a hundred years old, where they mature and settle for 6-8 months before bottling. The cellars here are reminiscent of traditional Barolo cellars bearing no resemblance at all to the gleaming, modern, stainless steel tank lined cellars so common in this far southern corner of Burgundy. The Cóte de Brouilly appellation is the most refined of the three top cru, the other two being the more masculine Moulin-a-Vent and Morgon (and the small bit of Fleurie where Clos de Roilette is situated). To make a Còte d’Or comparison, this would be Volnay compared to Pommard. 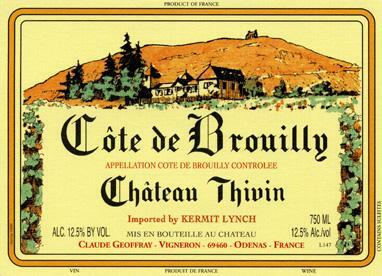 Thivin is unquestionably the finest source of Cóte de Brouilly and one of the longest lived of all Beaujolais if you like to age them. Deep, brooding nose of dark berries, fresh herbs and a bit of woodsmoke. Bright red and black fruit flavors with an excellent mid-palate firm acidity, ripe tannins and a long sappy finish. Hard to resist opening these when they arrive but will improve for years in the cellar.